Customize your foodservice facility and revolutionize your food preparation with the most advanced commercial induction equipment available. 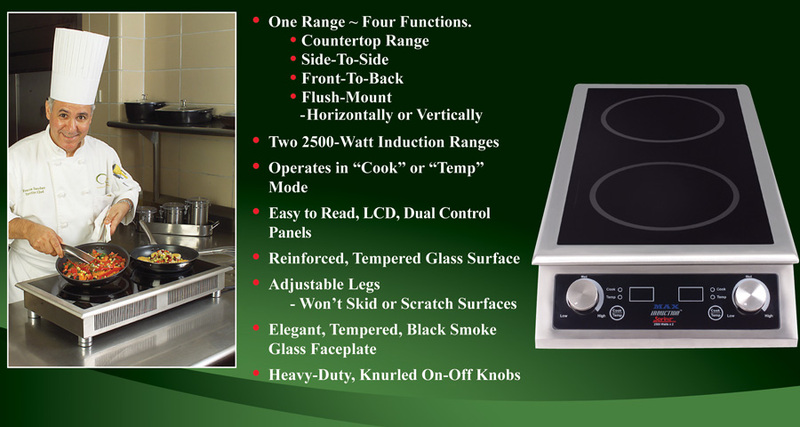 Perfect for demonstration cooking and suite service. LED display shows power levels 1–20 on cook mode, and temperatures 90° F – 440° F on temp mode. Computer “chip” printed circuit incorporates state-of-the-art software and hardware. Range adjusts output for voltage, pan size, weight and pan construction. Provides over/under current voltage protection. Low voltage power is more circuit friendly.“Chip” is our built-in service technician. It automatically adjusts to voltage fluctuations. Unit is reconfigurable! The control panel can be removed and placed along the short side of the induction range, allowing the ranges to be used front to back, instead of side to side. Perfect for an area where space is limited! Reconfigurable range can be used as a countertop unit, or can be flush-mounted into a counter. Range features our adjustable, non-skid, non-scratch footing.